You can spend hundreds on a contemporary piece of costume jewelry, or for the same amount own real gems and precious metals, infused with mystery and age. Online dealer Potala World (Andrew Failes and Sandra Park) visit Tibet, Nepal, Laos, Burma and Thailand regularly. Browse their site for treasures and advice about heading to this part of the world, and capsule summaries of their trips. Several magnificent examples of their pieces, below. 18 karat gold with pearl, sapphire, opal, coral, citrine, emerald, peridot, garnet and a central ruby. Among the Newari people of Kathmandu, the nine jewels are thought to bring harmony and balance which in turn bring good health. On the back of the ring is an engraved double dorje. Sizes 7, 7 1/2 and 8. The face of the ring is 1" long. $475. Old glass beads made to simulate carnelian. Wonderful old bells made by the lost wax process, now so old that they are worn through in places. 28" long. $395. A traditional Nepali style in repouseé gold and solid chains with a secure backing. 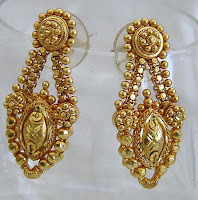 The gold has been faceted, so these earrings really sparkle. $325. Those are really unique. I love the ring. Those are really gorgeous pieces! 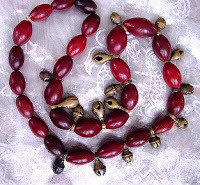 I love that "carnelian" -- wonderful, deep colour and beautifully shaped beads. This is my sort of jewellery, but only one piece at a time. I would love the ring and may enquire whether they ship to the UK. If you are interested there is a UK site and shop at devotion.co.uk which sells similar artifacts but not antique. They also sell interesting clothes and coats made from recycled saris. It's worth a browse.